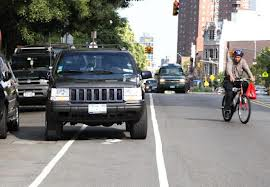 Are you one of those drivers who’ll park in the bike lane while picking up a coffee from Dunkin Donuts or waiting for a friend to come downstairs? Starting next month, you’ll be fined $50 and possibly towed. A new amendment to city traffic laws, adding bike lanes to the list of places where drivers may not leave their vehicles, goes into effect Oct. 31. Other amendments to the General Towing Prohibitions and the Penalties sections allow for a vehicle to be towed or a driver to be fined $50 in the event that someone does park on a bike lane. Police say they’ll have no problem enforcing the law, but are concerned with cyclists disobeying traffic requirements as well. Cyclist Lauren Clayton said the requirement was “vague” and asked to include the clause, “subject to complaint by bicyclists,” which the Traffic Commission approved, said Somerville Police traffic commander James Polito. This entry was posted in Bicycle Laws, Bike Lane and tagged Monica Jimenez, Somerville Bicycle Advisory Committee, Wicked Local Somerville. Bookmark the permalink. Please consider making a donation (your dollars support marketing and educational efforts). No amount is too small.